The last few posts have been pretty heavy; theologically weighty, if you will. So I thought I would take a break and present a topic to hearten our spirits. It may seem like a trivial subject but it actually has great consequences not only here on earth, but in heaven and in the spiritual realm, too. So, today I'd like to address acts of kindness. The Bible tells us that "the fruit of the Spirit is love, joy, peace, patience, kindness, goodness, faithfulness, gentleness, self-control; against such things there is no law" (Galatians 5:22-23). When we break these two verses down, it looks like this ... the word fruit is the Greek word karpos and is loosely translated as "harvest". Digging in deeper, Strong's Concordance tells us the word means the fruit that is produced by the inherent energy of a living organism; the visible expression of power working inwardly and invisibly, and the character of the power producing it. So, ultimately, the "fruit of the Spirit" suggests the unity of the character of the Lord as reproduced in us [through the presence of the Holy Spirit]. You might want to meditate on that for a moment. Simply put, yes, it is a harvest, but it is a complex concept. So, now let's take a look at kindness. It is the Greek word chrestotes, and Strong's says it signifies not merely goodness as a quality, but it is goodness in action, goodness expressing itself in deeds, showing grace and tenderness and compassion. That's an academic and somewhat impersonal description of kindness as a fruit of the Spirit. So what does it look like in reality? Well, I'm going to give you a personal example, and one that I am very proud of. My niece and God-daughter, Kaylee, has a sweet and tender heart and sincerely loves the Lord. She is somewhat of an anomaly in this Millennial generation. She decided that she was spending too much time on Instagram (a social media platform) and canceled her profile. She is passionately pursuing a relationship with Jesus, and writes a blog about how her experiences and dedication to a righteous life sometimes leaves her walking a lonely path. But don't feel sorry for her! She is a beautiful and vibrant young woman who has a witty sense of humor and will one day make an amazing wife for the man she is waiting for the Lord to bring into her life. And she will soon be starting her career as an elementary school teacher and will bless the lives of the children who are placed in her path. But this is a blog post about kindness. And I want you to hear how Kaylee epitomizes this fruit of the Spirit. I wish you could hear her tell the story, because she is much more entertaining than my words on this screen, but I will do my best. She had just received her paycheck and decided she needed to go to the pet store to buy her beloved puppy some dog food. The weather was bad and she was carefully making her way to Pet Smart when, on the side of the road, she passed a homeless man and his little dog. You have to understand the members of our family -- we are all fervent dog lovers and the multiple pets we own are loved by all of us; literally members of the extended family. So Kaylee's heart was instantly touched by the sight of the little dog in the cold, nasty weather. 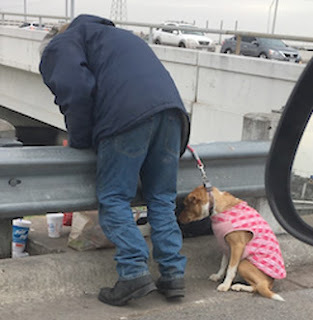 As she passed the man and his pet, she decided that since she was going to buy food for her own dog, she would get some for the homeless dog and return to deliver it. When she got to the pet store, she purchased food, a couple of toys, a blanket and some dog chews. As she often does, she struck up a conversation with the clerk, explaining that she was buying these for a dog who was on the street in the inclement weather. The clerk told her that he would help, too, and gave her a discount. [Kindness is addictive]. So she drove back to the corner where the man and dog had been, praying that she would hit a red light when she reached them because there was no place to pull off to distribute the goods. The Lord heard her prayer and the light turned red just as she approached them. She rolled her window down and gave the man what she had purchased for his dog. He was so thankful and couldn't believe that she had made the effort to come back -- it would have been so easy to keep driving and never think about them again. But Kaylee's act of kindness was not finished. Before the light turned green and she had to drive off, she said her heart was pricked with the idea that she should bless the man, too. She said she had heard the advice to not give the homeless money because they often bought alcohol or drugs with it, but that's all she had to give him, so she reached into her wallet and gave him the cash she had. Now, Kaylee didn't relate this story to receive accolades or praise. Her story was really more about her feelings for the little dog and the funny narrative of maneuvering through the traffic to secure the perfect timing of reaching them. But I know better. I know that it was the power of the Holy Spirit to produce the heart of Jesus in her, in that moment. She didn't hesitate, she didn't make excuses why it was too much trouble or that she would be late to work. She just displayed the goodness of her nature, and acted with grace and tenderness and compassion. This may not be a story of great import or impact. But you know what? God doesn't require blockbuster deeds. Simple acts of kindness such as this can change a person's life. This is the divine love of God expressed by a young woman who belongs to Jesus Christ. Not only did she touch the life of the homeless man and his little dog, but Heaven took notice, too. When she stands before Jesus one day, she will receive her crowns and rewards for living a life that pointed others to the love of Christ. To the world her actions may look insignificant. But to God, on that rainy, icy day she was the visible expression of the power of His love. And who knows what her actions might inspire in others? I know her life will be a bountiful harvest! Thank you Kaylee! What a wonderful act of love and kindness. God is watching and God knows whose hearts belong to Him and you are definitely one. Thanks for sharing this great story. We sure could use many more like it. Thank you Pam. God bless you and all of your family.